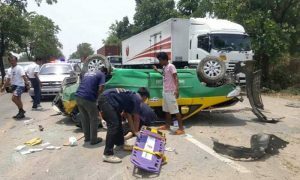 A Danish passenger in a Bangkok taxi died yesterday when the vehicle overturned in Kamphaeng Phet. His Thai girlfriend and the driver survived. Police think the driver fell asleep at the wheel. Cops and medics who arrived at the scene in Don Taeng sub-district found the taxi on its roof in the opposite lane. Dead in the back of the cab behind the driver was 51 year old Thomas Barch, reported Thai Rath. Driver Surasak Jandaeng, 51, from Pathum Thani had head injuries while the Danish man’s girlfriend Daeng Sukkun, 26, broke her arm. Both were taken to a local hospital then transferred to Kamphaeng Phet Hospital. The driver told police that he had left Bangkok at 5am and reached Tak at 10am. He was taking the couple to Pattaya. Police believe he fell asleep at the wheel before coming round and losing control of his vehicle as he was too close to the car in front. He entered the central reservation, hit a power pole and overturned in the oncoming lane. The accident happened between kilometer markers 395 and 396 on Pahonyothin Road.